Why is October the Stock Market's Most Volatile Month? There is an ancient Chinese curse – “may you live in interesting times.” The saying has a sort of wry truth to it. After all, quiet and persistent growth isn’t very exciting, while lurches and crashes in the market are very interesting, indeed. With that in mind, as we approach the month of October, we should keep in mind that it is the most interesting time of all. October has traditionally been a time for market disasters. On October 29, 1929 – known as Black Tuesday – the market fell 90% in the event that would trigger the Great Depression. On October 19, 1987 – known as Black Monday – the stock market fell by 22% in one day. The financial crisis of 2008 brought a stock market plunge that began on September 29 of that year and continued through the first week of October. Clearly something is going on in October. But what? There are many theories. One theory suggests that after a summer of vacations, many stock market analysts and traders return after Labor Day and begin to make major trades. This causes an uptick in volatility that spikes a month later, in October. Another theory suggests that the volatility is influenced by the US Government, whose fiscal year begins on October 1. Perhaps it is aligned with changes in the Chairman of the Federal Reserve, whose term ends every four years in January, and whose replacement is often named in October. A final theory suggests that it is simply a reflection of companies reporting their 3rd quarter returns (giving an idea of the summer season). 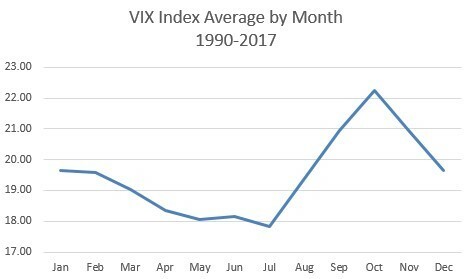 It’s difficult to be entirely certain what causes the rise in volatility in October. However, it seems likely that – as usual – the market will be in for a bumpy ride. Not all is lost, however. Though October brings volatility with it, it does not always bring market crashes. Since the financial crisis, in fact, the 4th quarter of the year has been associated with the largest stock market gains. So don’t necessarily rush to sell off your portfolio. But maybe don’t check it every day this month – it’ll be better for your nerves. Where should you go on your next vacation? Your satisfaction and enjoyment level may depend on who you are, according to psychologist Joshua Jackson, associate professor at Washington University in St. Louis. He identifies five core personality types—extraversion, agreeableness, conscientiousness, neuroticism and openness. And then he identifies a great potential vacation destination for people with each personality trait. IRA distribution planning is entering a new world, a departure from the days when simply dropping dollars into a traditional IRA was the sensible thing to do. With the growing complexity of the new tax act, and the substantial growth of savers’ IRA accounts, distribution planning is becoming a high stakes game in more ways than one. We review below three things to consider for anyone who owns a large IRA. A traditional IRA is, well, traditional, and is the more common type of IRA used. Traditional IRAs allow for deductions on contributions when made, which helps decrease the owner’s tax burden, but requires taxes on distributions in retirement, which obviously decreases after-tax funds in retirement. The real issue with traditional IRAs are those pesky required minimum distributions, or RMDs, the first of which must be taken by April 1 of the year after the year in which the holder of the IRA reaches 70½. RMDs are becoming more and more of a problem as people accumulate large IRAs which then trigger large RMDs which then trigger additional (and substantial) taxes and surcharges in retirement. For example, the RMD on a $1 million account for an 80-year-old person is $53,476, which is a lot in and of itself. But combine years and years of RMDs and the resulting taxes, and the cumulative total just keeps climbing. Thankfully, there is no change on IRA charitable transfers. This makes qualified charitable distributions, also known as QCDs, a handy way to get around the RMDs. Retirees 70½ and older can donate IRA assets up to $100,000 directly to charities and have the donations count toward their RMD. For those IRA owners who give to charity, this is often a tax-efficient move, as the donor can take the standard deduction, (as opposed to itemizing), and reduce their taxable income even further when donating to charity. Roth IRAs don’t give the contributor an initial tax deduction but have more potential long-term benefits in part because there are no RMDs to manage. This means that future tax-free withdrawals taken from Roth IRAs won’t push the holder of the account into a higher tax bracket or trigger higher Medicare surcharges. That is a definite benefit as exceeding Medicare income thresholds by even $100 can end up increasing annual premium by thousands. An individual with income just $1 over $160,000 can expect to pay an annual Part B Medicare premium of $4180 versus $1608 per year. That is a surcharge of at least $2500, and it can get progressively worse at higher incomes because of the cascading effect of the additional taxable income. Limiting taxable income is more important than ever, now that the threshold for deductible medical expenses for those under 65 has been increased from 7.5% to 10%. This means that at $160,000 of income, you will need to have $16,000 of medical expenses before you can even consider deducting them, thereby driving up taxes even further. A Roth IRA can also increase the level of asset protection in states where they’re protected against creditors. And the Roth IRA conversion can avoid double taxation in states that have a state estate tax. Equally, if not more important, a Roth IRA is able to grow over a non-spouse beneficiary’s lifetime, potentially providing tax-free distributions over several decades. Let’s explore both ideas below. Converting to a Roth IRA can also help transfer wealth and save on estate taxes, which can get expensive! For instance, an investor with a $1,000,000 traditional IRA and a $1,000,000 investment account reports $2,000,000 on their estate tax return (along with any other assets of course). However, if the investor were to convert the traditional IRA to a Roth IRA, they would then have a $1,000,000 Roth IRA and a $650,000 investment account (after the taxes are paid for the Roth conversion), assuming the tax rate on the conversion is 35%. This makes the total estate value $1,650,000, but the Roth IRA account now is growing tax free. Converting to a Roth IRA makes $350,000 “disappear“ and can result in an easy wealth transfer and potential estate savings. For a Roth conversion, there’s no minimum or maximum amount regarding how much needs to be converted, and with the ability to unconvert taken away, partial conversions are the way to go. This flexibility can be utilized to make a series of annual partial conversions, which can convert even a large IRA over time without pushing income up into higher tax brackets. This decreases the risk that the investor will be facing on an annual basis. And over time, even a small annual conversion can add up. A rule of thumb is to diversify IRAs, as diversifying between traditional and Roth IRAs both minimizes risk in terms of an unexpectedly large tax burden and helps protect taxpayers against future tax law changes, which can be both unpredictable and confusing. For example, according to a study recently published in the Wall Street Journal, an investor should consider contributing to a traditional IRA account at their age plus 20%. So, if you’re 30 years old, put 50% of your savings in a traditional IRA account and the rest in a Roth IRA. A strategy called “filling the tax bracket” is typically used with partial conversions. This is because converting an IRA is not an “all or nothing” deal, so partial conversions can be strategically deployed. Savers are able to make partial conversions that “fill” their lower tax brackets (as conversions to Roth IRAs mean that the value of the account is added to current income), but stop just short of allowing “too much” income to overflow where higher tax brackets come into effect. This is especially applicable for clients with similarly invested IRA accounts who want to convert. Converting such large accounts all in one can actually hurt the investor, as they can be pushed into far higher tax brackets than normal, which can trigger Medicare surcharges, among other things. However, by spreading conversions over a number of years, and making sure that the Roth conversion doesn’t raise the investor’s tax bracket, the investor will be able to make conversions while staying at the income tax level they are accustomed to. Take Sean and Linda. Their taxable income (current combined income after deductions) is $110,000, putting them in the 22% tax bracket. They have a $600,000 IRA that they want to convert to a Roth IRA, so that they can avoid RMDs and withdraw income in retirement without paying tax on it. However, if they convert the entire account at once, their taxable income will be $710,000, placing them firmly in the top bracket of 37%. They would then have to pay $182,395 in taxes for the conversion, which is so high that they arguably might as well just leave it as a traditional IRA and pay tax on the money when they withdraw it. However, Sean and Linda could instead convert $55,000 while remaining in their current 22% bracket. They would then only pay about $22,899 in federal income taxes that year. Or, they could convert up to $205,000 and only end up in the 24% bracket, which is much preferred to the 37% marginal rate. Although this wouldn’t convert all the money at once, doing partial conversions like this one for a few years gets Sean and Linda the same result, but their tax rate throughout is much lower! Assuming their taxable income remains at $110,000, it could take them 11 years to convert the entire IRA and remain in the 22% bracket, and the conversion would cost them a combined $133,045 in additional income tax. However, considering that converting the entire IRA at once would cost them an additional $182,395, spreading the conversion over 11 years saves the couple a total of $49,350 in income tax (although they would lose out on the growth of the investments in the Roth IRA). However, there is another way to go about this. By converting $205,000 per year for three years, they would be taxed in the 24% bracket. The total added tax burden of the three annual partial conversions would be $142,845, but they would still save $39,550 by spreading it over three years and not converting all the money immediately. So even large partial conversions over a small number of years can have a drastic benefit in terms of money saved. As you can see from this variety of examples, these strategies involve a certain level of complexity and require some thought to execute productively. But, asking your financial advisor to employ these strategies can be a major game-changer and save you thousands of dollars.